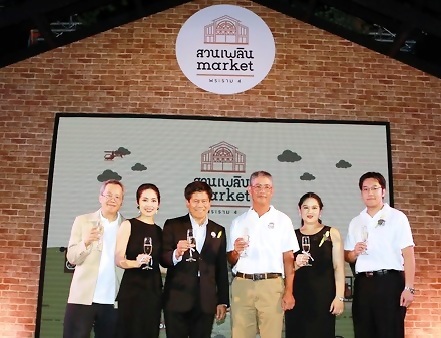 Welcome to a new solution for every lifestyle need at Suanplern Market, a new market mall on Rama IV founded and managed by Athakehaputt Company Limited, promising enjoyment and pleasure under the concept “Happy Shopping, Happy Eating”. The market mall features enjoyment for every lifestyle amidst a lush green environment, offering a feeling of a second home. The grand opening ceremony of Suanplern Market will be held on March 7, 2016 at 6 pm at its Activity Square. Prof. Dr. Kantathi Suphamongkhon will preside over the opening of the multi-colored fountain - the landmark of the venue - to mark the grand opening ceremony. Capt Atichart Athakravisunthorn will give an opening and welcome speech. While Suanplern Market’s executives Napawong Snidvongs Na Ayudhya and Chanoknart Pakornsiriwongse will warmly welcome honorable guests, partners, and members of the press. Also making an appearance at the event are famous mother and daughter couple – “Bow” Vanda Sahawong and "Mali" Phakwan. There will be a special performance "Happy Housewife" which will introduce the guests to various zones in Suanplern Market. Celebrities Jareyadee Spencer and Sothipan Kamleucha a.k.a "Amen The Star" will join the event for a special chat too. Capt Atichart Athakravisunthorn, director of Athakehaputt Company Limited, a company with long experience in Thailand's real estate industry, particularly in commercial buildings, office buildings, and condominiums in Sukhumvit and Rama IV areas, said, "As the developer of Suanplern Market, we are delighted and honored to have created a high quality market mall to meet the needs of residents and office workers, both Thais and expats, in Sukhumvit and Rama IV areas. 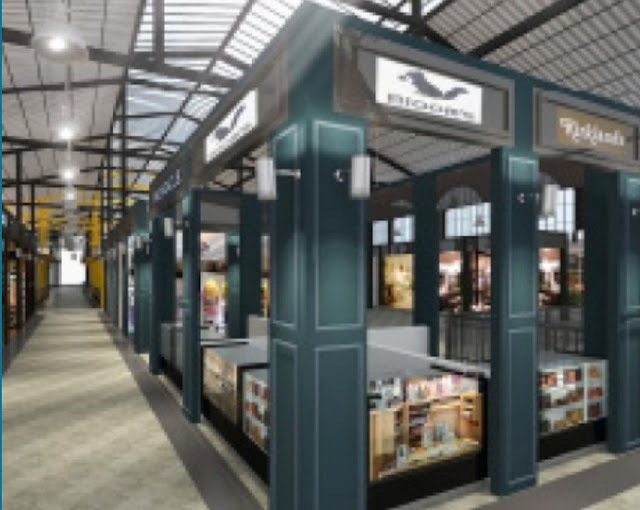 There are many office buildings around here, so Suanplern Market will change the dining and shopping lifestyle by introducing more convenience and enjoyment, different from other community malls. 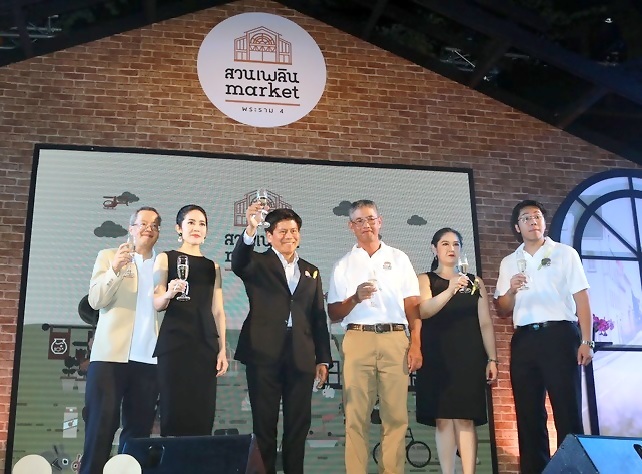 Suanplern Market focuses on product diversity at various price points for accessibility. 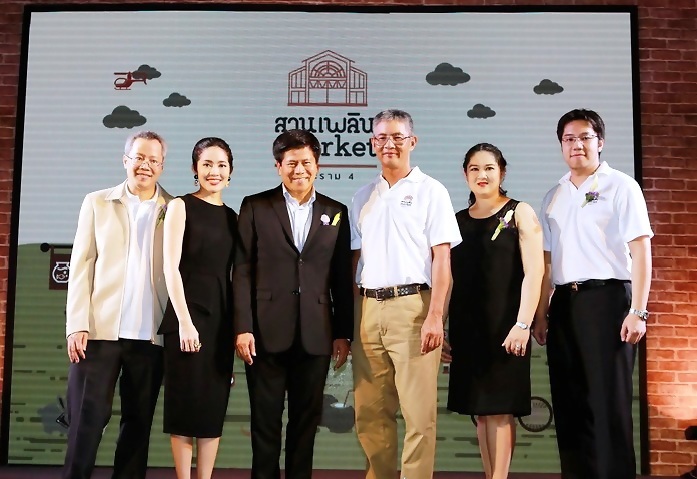 "Suanplern Market aims to offer a wide selection of stores at an easily accessible price, ranging from bigger establishments like Zen, Nitaya Kai Yang, Boots, Mos Dental Clinic to smaller ones and online stores who want to have a brick-and-mortar store. The diversity will create lifestyle choices that are unique, modern, and convenient. We offer all the facilities that cater to the needs of our target groups, which are office workers in Sukhumvit and Rama IV areas, families, expatriates living or working in the area, and those who hang out in the city. We plan to organize regular events and activities at our 700 sq m activity square, with constantly changing displays to attract visitors all year round," said Capt Atichart. 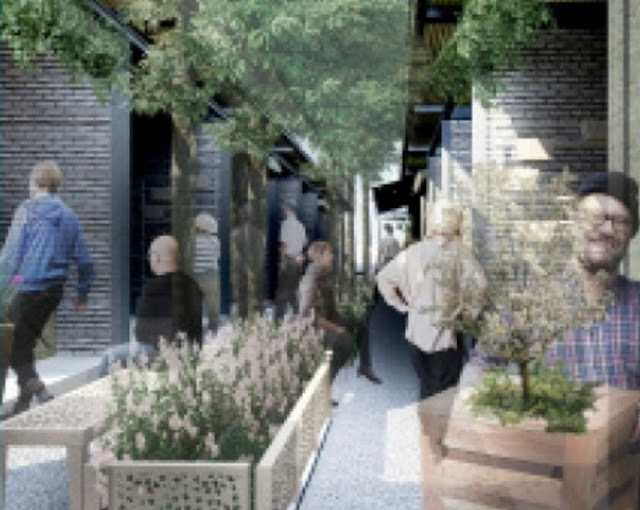 The project is designed in an “industrial loft” concept, inspired by Thailand’s first railway line, the Paknam route, which was constructed during the reign of King Rama V and ran past where Suanplern Market now stands. Red bricks and black metals are used, while the ceiling is heightened like a train station in the past. The ground of the project has lines replicating railways, leading to various zones. 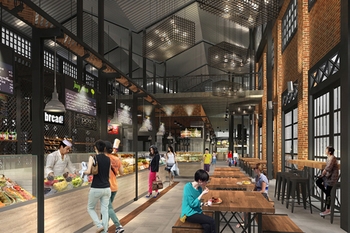 Suanplern Market is designed as a 2-storey air-conditioned mall, offering more than 250 shops divided into zones for convenience. 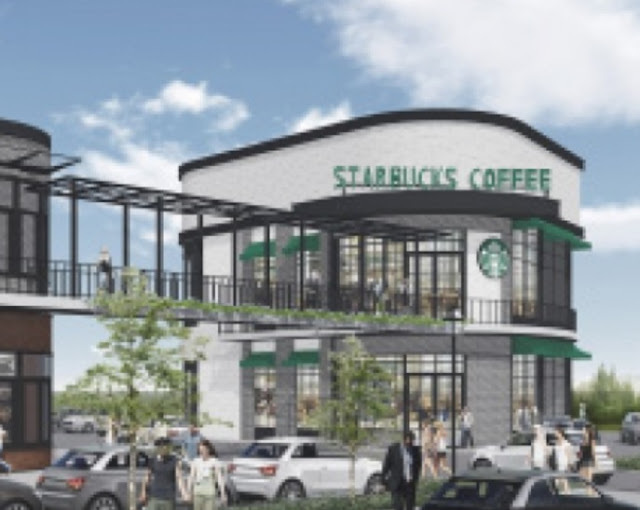 The Food & Beverage zone features a Food Hall with famous eateries from the past and the present including Yong Kee pork with rice, Tiaw Nar Klang noodles, Mantaro by Kinniku Gyudon, Zen, Santa Fe Steak, Nittaya Kai Yang, T24, Shabu One and the first downtown Starbucks Coffee Drive Thru. Customers can choose to dine-in at the Food Court or take-home. Fashion Zone offers clothes and accessories from virtual stores and well-known brands at affordable prices. The brands on offer include Kawaii Lady, Commeci Commeca, Meredith_Onlineshop, Sweet April, and Little Gift. Plant and pet lovers should head to Plant & Pet zone, a pet-friendly zone offering everything you need for your pet, including a vet clinic, and gardening supplies for plant lovers. Get beautified from head to toe at Health & Beauty, with services such as nail and hair salons, dental clinic as well as a beauty and aesthetic center. Home Décor zone is for the decorative minds, while Hobby zone features collectibles and hobby items. Stay on top of technology trends at IT& Gadgets zone and shop new gadgets such as phones, computers, electronic devices and accessories. Check out the pleasure of every lifestyle at Suanplern Market, a new market mall on Rama IV. 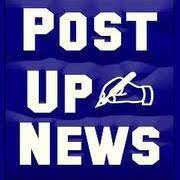 For the latest updates, please visit www.facebook.com/suanplern or www.suanplernmarket.com. 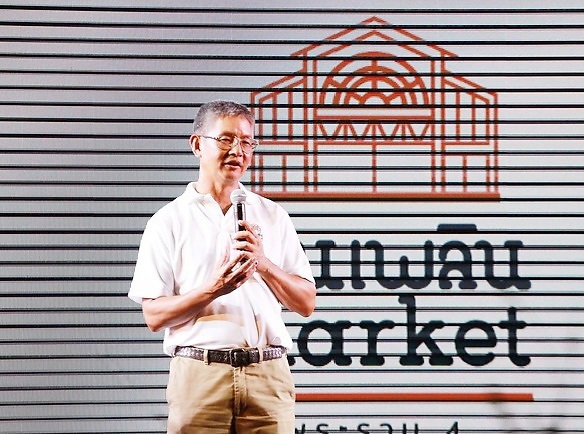 Suanplern Market is the first unique market mall on Rama IV road, managed by Athakehaputt Company Limited, a company with 48 years of experience in real estate development. 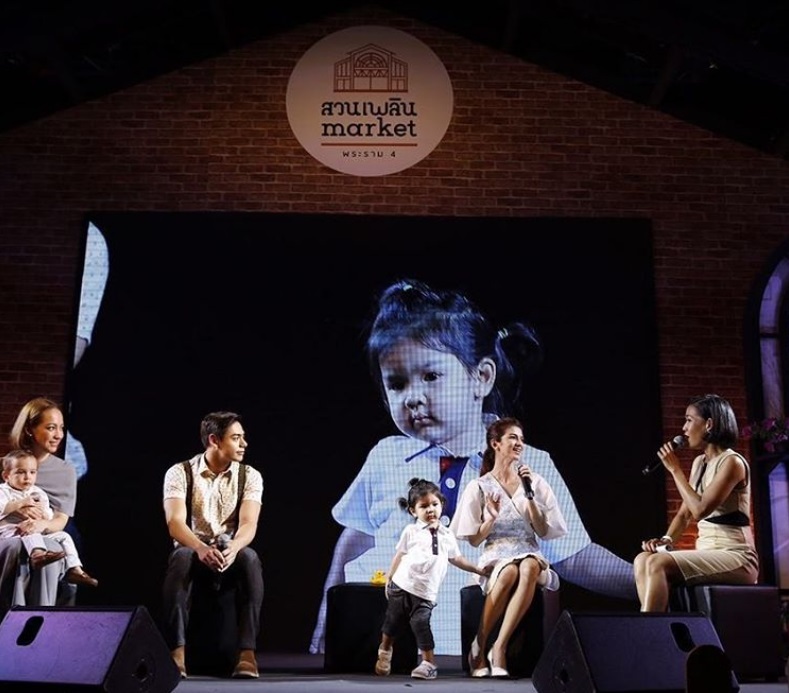 Our company's recognition of the potential of Rama IV area, coupled with the fact that most homes and offices today come with limited space, inspired us to create this mall as a second home for urban dwellers. 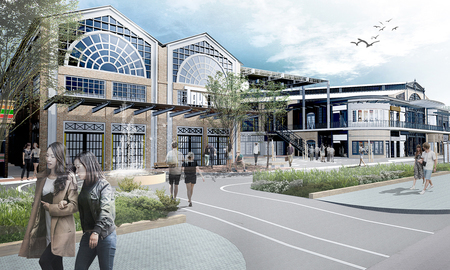 This is a place for relaxation and activities, fulfilling the needs of those who live and work in this area. 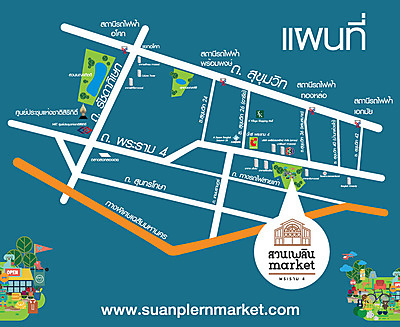 Suanplern Market is designed as a place where people of all ages can come together to relax and have an enjoyable time. 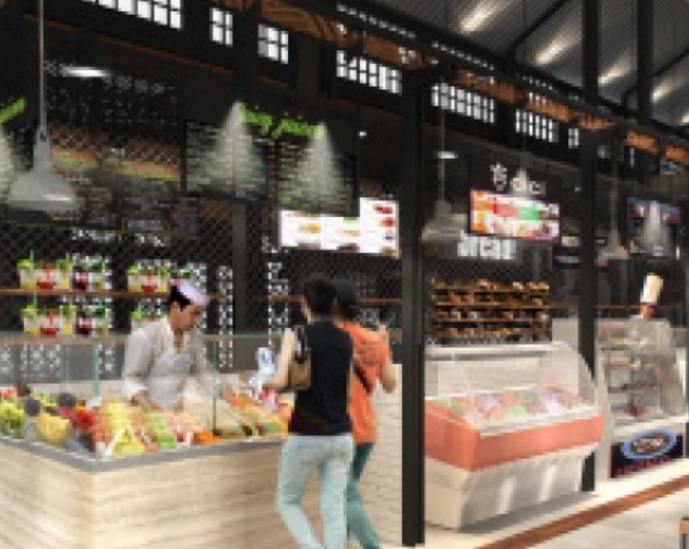 The building, designed under an industrial loft concept, has a “railway station” theme inspired by Thailand’s first railway line, the Paknam route, which ran past where Suanplern Market currently stands. Suanplern Market provides a unique shopping atmosphere with a wide variety of shops surrounded by greenery. The covered 700 sqm Plern Station welcomes locals and passers-by, families and friends of all ages to come and enjoy the fun activities. Here, everyone will feel like they are relaxing in the living room of their second home. The venue is also suitable for holding markets, events and concerts. Good news for pet lovers, pets are allowed in all areas, except in the Food Hall. 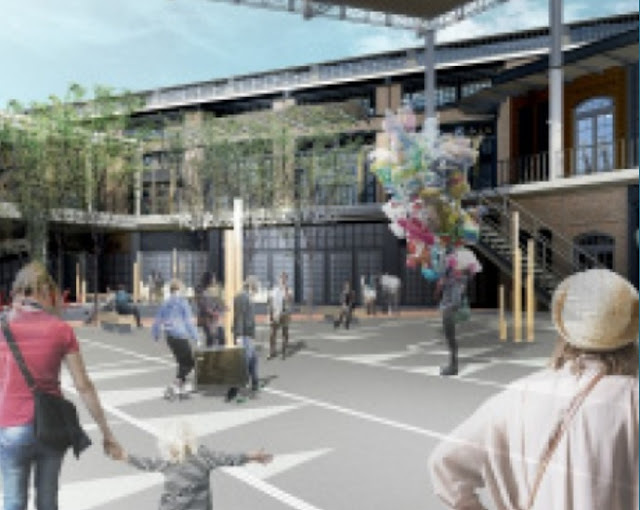 Suanplern Market offers a new style of urban living. Our main target customers are families in Sukhumvit and Rama IV areas, office workers, expatriates living or working in the area, and those who seek a special shopping experience. We plan to organize regular events and activities, with constantly changing displays to attract visitors all year round. 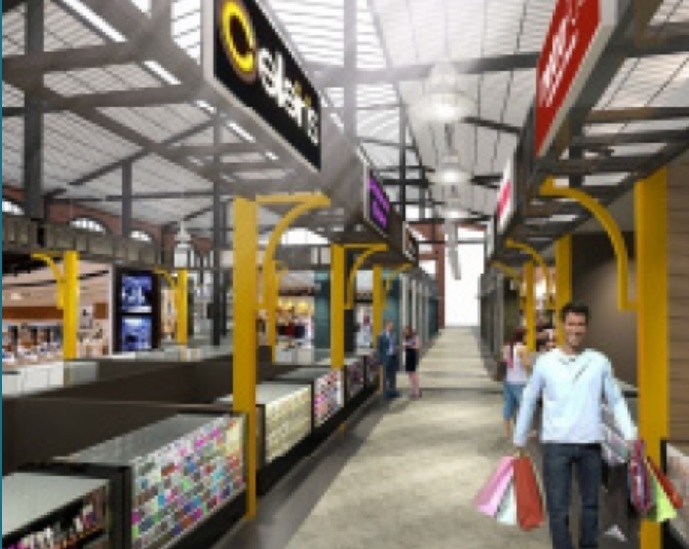 Suanplern Market is designed as a 2-storey closed mall, with various zones to create a complete and convenient shopping experience. Food & Beverage Zone (Food Hall): Famous eateries are available for dine-in and take-home options. 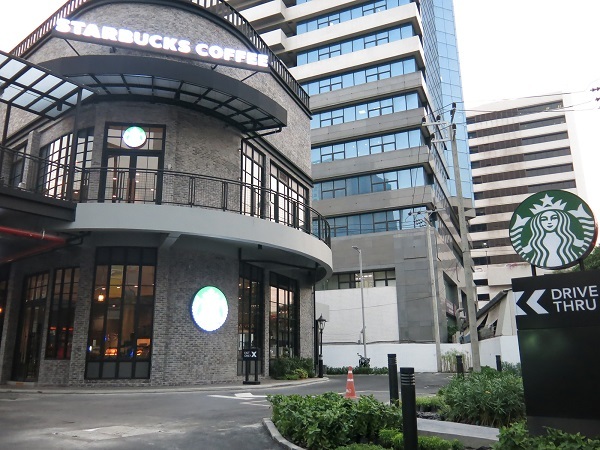 These include Yong kee pork with rice, Tiaw Nar Klang noodles, and Sab Le’ Noir somtam at the Food Court, as well as many more leading restaurants such as Zen, Santa Fe Steak, Nittaya Kai Yang,T24, Shabu One and the first downtown Starbucks Coffee Drive Thru. 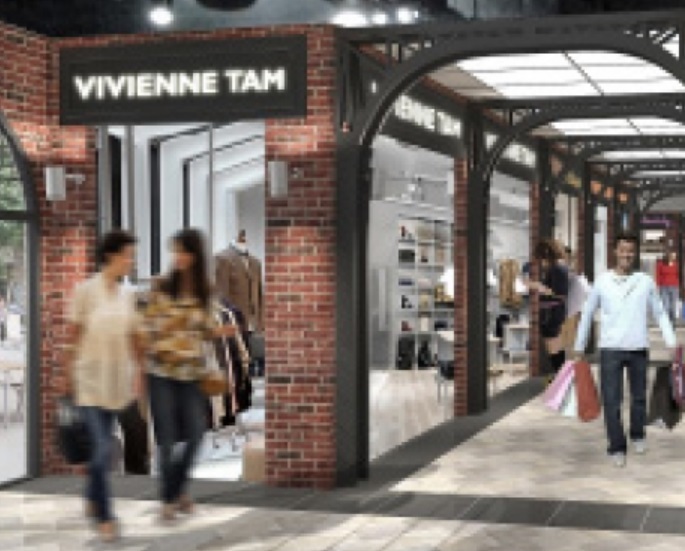 Fashion Zone: Clothes and accessories from virtual stores and well-known brands are available at affordable prices. Health &Beauty Zone: Get beautified from head to toe at our nail and hair salons, dental clinic as well as a beauty and aesthetic center. Hobby & Home Décor Zone: Discover your passion and grow your creative talent with our wide selection of home décor and hobby items. Plant & Pet Zone: Plant and pet lovers can have fun in this pet-friendly zone with pet shops & grooming, pet clinic, plants, garden décor and gardening supplies. IT & Gadgets Zone: Stay on top of technology trends and shop new gadgets such as phones, computers, electronic devices and accessories.